The fourth Big Bang Adventure Race proved to be a big challenge for some of the teams with the expected six hour race becoming over 10 hours of “torture” for some!! With a record 70 teams, including five college teams from Opunake and Wanganui, there was only one bad accident and some teams losing their way through the back hills from Kimberley Reserve to Manakau School. But almost everyone had a smile as they finally crossed the finish line. The race set off from Kimberley Reserve at 8am on race day, November 1, to follow a course running up the Ohau River, before tubing back down to the starting point, followed by a run or walk to Florida Road where they picked up their bikes and rode to the end of Tangimoana Road and through to top of Kuku East Road, before they took to the hills on foot to test their navigation skills. Then it was back on their bikes through farmland, with a detour for some team building – well fence building, nailing the battens onto the farmer’s fence! Some hammer skills were very different! Then it was back on their bikes and ride to the Waikawa Shelter before tramping the over the hill through the pine forest, finally emerging in Manakau village and with what energy left, either run or walk the 300 metres to the Manakau School and down to the finish line. The organisers said the course was “not that difficult”. Competitors had to work as a team, pass each check point and transition stage – where they changed the mode of transport or task. Missed check points meant a one hour penalty was added to their score. Each team “captain” had a small “memory” stick which they had to click into the recorder at each station – the whole team, two or four people, had to be at the check point before they could click in. 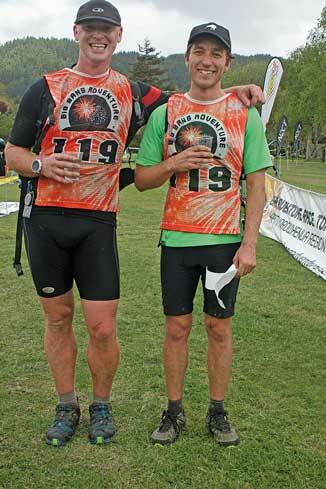 Team Ren and Stimpy, also known as Barryn Westfield and Ewan Dellow from Wellington were the first team home in 6.04 hours and overall winners, taking the two man team title. One team took four and a half hours to navigate through one early section which most completed in an average of one hour! Some teams gave up at the Waikawa Shelter and biked down to highway and walked the rest of the way back to Manakau School! Those waiting at the finishing post watched one very off course team crossing a paddock and climbing fences along the foothills behind Manakau before finding their way down! With about 50 teams making it back by 5.40pm and sufficient results through, Ms Yaxley, announced the results and awarded the prizes. There were several local teams including the Otaki Surf Lifesaving Club’s team Uncivil Union – Paul Carlyon and Abraham Growcott, fourth time competitors; brothers Ricky and Kerry Bevan in team Mountain Rescue –“hard work, lost again” Kerry said; and Manakau land owner Andrew Martin, whose fence the competitors were “building”. With several categories available there were a variety of teams – either men’s or women’s two and four person teams, or mixed teams of two or four, from the earnest competitors to those out for a day’s “fun”. The mixed team of four – No Skin in the Game covered most of the trek dressed in skeleton suits and Scream masks! While the overall winners finished in six hours, the first women’s four team Brooklyn Bandits took 8 hours 15 minutes to finish. After 6.30pm the last teams were picked up and driven out of the forest, after their long hard day in the hills and the bush. Non-competing surf club members made up the first aid team, and mainly dealt with minor scrapes, but had two sprained ankles to attend to and one dislocated shoulder which required transfer to hospital. The Palmerston North LSAR (Land Search and Rescue) team covered the back country areas, setting people in the right direction. Most of their members were already involved in a search and rescue behind Otaki, but the main time keeper had tramped out from Kime hut overnight to be at the race headquarters. Team 17 No Skin in the Game from Wellington, remained incognito as they made it to the finish line after battling hills, bush and brambles for over nine hours at the Big Bang Adventure Race. They had worn their skeleton suits and Scream masks for most of the race; the suits didn’t improve their navigational skills as they missed quite a few check points! The Rotary Club of Otaki was on hand to provide meals to teams and support crews and there was hot coffee and cold drinks available too. The event is secure for another nine years after Department of Conservation granted a 10 year concession to use DoC land for the for the event, Ms Yaxley said.